From left: Werner Engelbrecht, KDZA Managing Director. In third place, Jacques Koen Lombard from Ronmar Office Equipment. In second place, Matthew Townsend from NRG Office Solutions. In first place, Chris Pelser from Page Automation; Nancy Meyer, KDZA Business Development Director; and Lee Ann Kellner, KDZA Sales Manager. 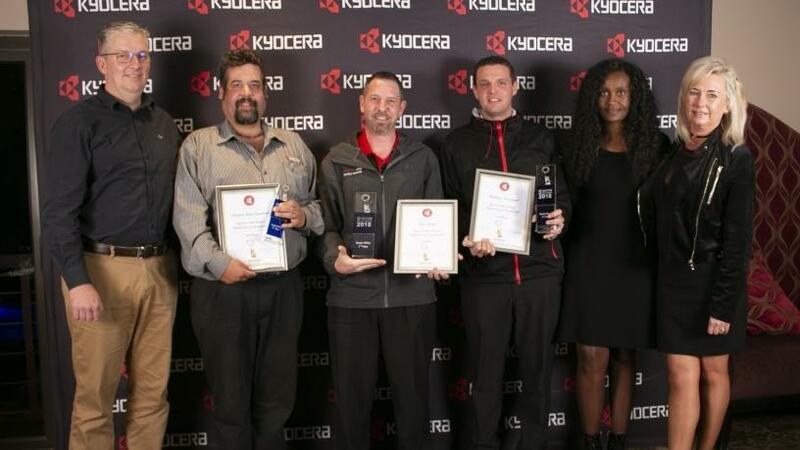 KYOCERA Document Solutions South Africa announced the winners of its 11th local Service Awards, honouring its top engineers at an exclusive ceremony held in Johannesburg. KYOCERA Document Solutions South Africa prestigious awards recognise the dedication, skills, knowledge and outstanding technical abilities of its certified engineers, who competently deliver technical solutions to resolve its customers' technical queries on a daily basis. "Our customers are looking to do business with service partners who are able to support them with their printing solutions, streamlining their efficiencies and driving down costs with new technologies and input," says Paul Wendlandt, KYOCERA Document Solutions South Africa Customer Services Support Manager. "Every business, regardless of its size, needs effective support, services and systems to gain productivity and stay competitive," he adds. "They do not want to purchase a product and never see the partner again. They want top-of-the-line products and the backup, support, skills and expertise that can only come from working with skilled and certified engineers." The Service Awards attracts 2 500 service engineers worldwide who compete to be the best in their country. The SA finalists, who get to compete at the Midrand head office, are determined via the participant's performance in an online exam, which certified KYOCERA service engineers from across the country complete. This year, 140 service engineers demonstrated their skills and knowledge of our hardware and software products. The top service technicians travel to Midrand and undergo further theoretical and practical exams ahead of the awards ceremony. "These awards are a true reflection of Kyocera's commitment to building a network of certified engineers and providing them with the products and solutions they need to deliver pre- and post-sales support for their clients," says Wendlandt. The top achiever, Chris Pelser from Page Automation, will go on to compete against other regional winners in the EMEA Annual Service Awards that's held at KYOCERA's European HQ later this year. The top three achievers of the European Service Awards earn themselves the prestigious and sought after all-expenses-paid tour of the Japanese headquarters and visits to factories in the far east. These awards are important as they not only reward the efforts of KYOCERA's technicians, but they give KYOCERA a chance to prove how rigorously trained the company's technicians are, which is a competitive advantage for KYOCERA. "Well done to all those who participated in the competition. The results were of a very high standard this year. We wish our winning service technicians the best in the international competition, and are hopeful that we will bring this prestigious accolade back to South Africa," concludes Wendlandt. KYOCERA Document Solutions, headquartered in Osaka, Japan, is a leading manufacturer of document imaging solutions and document management systems, including colour and monochrome multifunctional products as well as printers and wide format devices. KYOCERA's products are renowned for their unique long-life imaging components that provide greater reliability and less waste, resulting in a lower total cost of ownership (TCO) over the life of the product. The KYOCERA Document Solutions portfolio does not stop at hardware. A full suite of business applications and consultative services allow customers to optimise and manage their document workflow, unleashing the full potential of their hardware investment.